For Sale By Owner: Save A Little Commission But Lose in the Long Run? I was reading an article this morning targeted towards real estate agents going after For Sale By Owners (FSBOs) as listings. There are some solid points in the article, and there are a few that seem like scare tactics. But one data point I found particularly interesting, which shouldn’t be ignored, is that those sellers who sell their home without an agent get 16% less than if they used an agent. Here is the original research done to gather those numbers. In all fairness, there are times when I think FSBOs might make sense, and I’ll provide my perspective on that below. But, sellers and buyers beware. It really isn’t as easy as it looks. I encourage readers to look at both articles but wanted to also take an opportunity to throw in my two cents on the whole FSBO scene. If you have any real estate agent friends you may have heard the phrase “buyers are liars” slip out of their mouth after a dicey transaction. It’s agent water cooler talk. But, it can hold true. And “sellers are yellers…” yep, that can hold true as well. 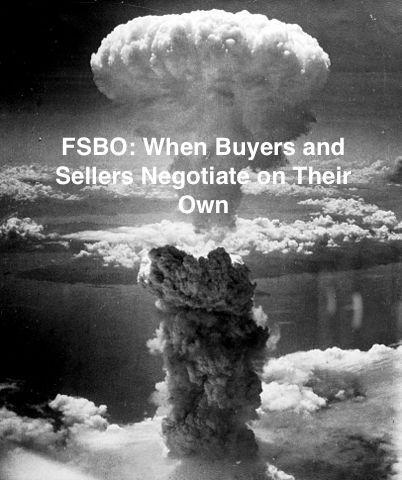 Setting aside the wonderful people who enter into a FSBO transaction (there are some) and the many delightful buyers and sellers who are out there (majority not the minority), let’s envision for a moment what happens when you engage two emotional parties together who are stressed out about one of their biggest financial assets. Many times, it’s a costly disaster – time and money. Part of a real estate agent’s job is to keep the peace and keep the deal moving forward. So much emotion. I have seen countless times when on the cusp of closing, the buyer or seller becomes exasperated with the final few demands and considers letting the deal fall apart. Cooler minds need to prevail in situations like this and that’s where an agent can be most helpful. Agents, by law, are required to be honest and fair, so they provide a buffer or a safe zone where perspective can be shared and turn the emotion to reason. Part of the reason for all the emotion is that a home is a very personal expensive asset. Sellers often think their house is just a little more special than everyone else’s. They’ve probably done a little-deferred maintenance and spent a little bit of money that they might even refer to as “recently updated.” Or, they think their 12-year-old renovation is still considered a renovation. This can be awfully touchy when said seller comes face to face with the buyer who, for example, says they want the house, but it’s a full gut, and they hate the circa 2002 renovation. The buyer wants to deduct from the price, and the seller digs in with no voice of reason on either side to finesse things. A good agent is skilled at getting through these emotions. The Inman article also mentions scams. OK, I haven’t heard of too many of those in our area. But, even the most “normal” looking people can get awfully slippery in a real estate deal. The real estate agent is there to make sure all paperwork is buttoned up early in the process and that the seller is protected and fully understands next steps, all deposits are placed securely in an escrow account, and all deadlines are adhered to. Pretend our two previously-mentioned buyers and sellers put a deal together. Maybe the seller got an early win on price or perhaps even a full price offer. The next opportunity for things to blow up is the good ole 10 day inspection period. Putting aside things like buyer’s remorse or buyers just wanting to “put the house on hold” for 10 days while they keep looking, the inspection period can be a beast. Some buyers use this time period to get the price down by making mountains out of molehills. And some sellers become weirdly unreasonable and will suddenly decide they don’t plan on fixing a thing (bad idea btw). Having two agents work this out is far better than a prickly seller and picky buyer trying to duke it out. Chances of a deal collapse are pretty high here. How about the financing contingency? Yet another way for the deal to go sideways. A real estate agent is very familiar with the financing process and can keep things on track with lenders who may be a little less than communicative. Seriously? Don’t you want to live here? Are those prunes on the counter? b) will likely spend way many more hours than they expected to try to market their property, and still likely get nowhere for their efforts. Seriously, take a minute to go look at the photos of some of the FSBO properties on the market right now. I won’t pick on anyone in particular, but at best, the photos are poorly curated with weird angles. At worst, they look like I did them on a gloomy afternoon on my iPhone after a couple of glasses of wine. For side humor, look at this agent/bloggers jab at bad agent photos. It’s not just about photos though, right? If it was, even the cheapest of people could just hire a photographer and get er’ done. There is also staging, print marketing, the increasing important land of online advertising, open houses and then the not so trivial agent advertising. Many listing agents refuse to work with FSBOs due to bad experiences. They are notoriously some of the hardest transactions to pull off. Often a seller who goes the FSBO route is super cheap (I mean frugal) and knows more than everyone else (or thinks he does). I’ve done several FSBO transactions that have gone off successfully and the sellers have been lovely. But trust me, they haven’t all been easy. There is much more room for misunderstandings when you are an agent working with a seller who is winging it on their own. Without an agent, the seller is really at the mercy of the buyer’s agent hoping they have a good one. I had one FSBO interaction recently where the seller wanted to accept a verbal offer from an out of towner who hadn’t even seen the property and thus didn’t want to show the property to my buyer. She didn’t even have a deposit. Good gravy! Many people that go the FSBO route end up either asking for lots of free advice from agent friends or attorneys. This can be a bad idea. First off, not every state has the same real estate laws or contracts. If one is seeking advice from an out of town agent friend, keep in mind, what’s true in New York may not be true in Florida. And, those attorney friends? God love them, but they can muck up a real estate contract by adding clauses and protections that are unnecessary and end up raising red flags on the buyer’s side. Having an agent you trust is key. The peanut gallery can really muddy the waters. And it’s often to the detriment of the sale. If FSBO sellers aren’t seeking free advice from their friends, oddly enough, they are oftentimes willing to pay large attorney fees to review the real estate contract. Oh why?! Northeast Florida real estate agents should know the purchase and sale agreement inside and out. And, the agent is ALSO there for showings, working with other agents, marketing your property, guiding you through inspections, assisting with next steps and oh so much more. At the end of the day, and I know this is self-serving, when you add it all up, 5-6% of the purchase price for the commission should not only be well worth it but also save you money (recall the original research). In addition to out of pocket expenses, I have to think one’s time is worth something to sellers. It’s why companies pay headhunters huge sums to find good employees and why people are going back to using travel agents. Should You Still Want to FSBO? Are you reasonable? Would friends and loved ones say you’re calm and reasonable under stressful circumstances? Are you and your spouse non-emotional about selling the house? Are you willing to deal with unforeseen delays, missed deadlines, hot-headed buyers? Are you in a hot market? Is it a seller’s market with inventory low and prices steadily increasing? Are you a marketer? Do you have the time, patience and skills to properly market your property, hold open houses, deal with lookey-loos, etc. Are you business savvy? Are you ready to take on difficult negotiations, handle off-contract requests, deal with 3rd party professionals like bankers, escrow and title agents? Pay for photography. I’m not going to give away phone numbers, but use your mad Google skills to find a real estate photographer. Hire an Online Marketing Person. Hire someone to do a good online marketing campaign for you. As a FSBO, you’ll need Google Ads to elevate your listing and strong targeted online contextual advertising. Understand the Northeast Florida Purchase and Sale Agreement. Attorneys have written it. It’s good and covers most things. It favors your buyer, but don’t go changing it. Just UNDERSTAND it. Offer a good agent commission! If you are going to force an agent to do double the work (yes, I said that), offer a good commission and advertise it widely so that agents understand you are a cooperative person. Hire a Stager. Not everyone has a great interior design sense. A professional is often needed to help de-clutter and make the space feel welcoming to interested buyers. Gwinn Volen is a top listing agent in the Northeast Florida beaches market with partner Jayne Young at Ponte Vedra Club Realty. Young & Volen cover the Ponte Vedra real estate market, the Jacksonville Beach real estate market, the Neptune Beach real estate market and the Atlantic Beach real estate market. They also specialize in luxury waterfront properties.